A series of manufacturers replacement football goalpost netting, net hooks and goalpost accessories. For socketed and freestanding football match and training goalposts. Support posts and netting elbows. Euro, UEFA and Portagoals. Integral weighted and box standard goal netting for both junior and senior sizes. Garden and mini training goal nets. 2mm, 2.5mm 3mm, braided and 4mm polyethylene FPX replacement soccer goal netting. Tested to BS8462 specification. Senior 7.32m x 2.44m replacement goal netting. Junior 6.4m x 2.1m match replacement goal netting. 2.44m and 4.88m five a side futsal & mini target nets. 9v9, 7v7 replacement football goalpost netting. 48 Aluminium goalpost net hooks FBL-229. 36 Arrowhead goalpost net hooks FBL-222. 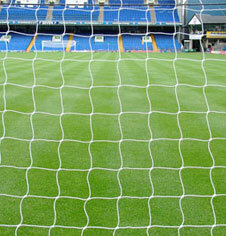 40 Goalpost velcro netting tie wraps FBL-227. 180 Black plastic goal netting attachment clips FBL-225. Continental steel tubular net elbow supports FBL-081. Continental solid HD steel elbow supports FBL-053. Stadium 3G steel tubular net elbow supports FBL-505. International steel tubular full net supports FBL-066. Hinged socketed goalpost net supports FBL-191. Stadium socketed goal support post pads FBL-505. Stadium socketed goal net support post FBL-539. Stadium Pro socketed net support posts FBL-849. In ground goal socket lids and caps FBL-170. 50 x steel goalpost netting ground pegs FBL-505. Wall mounted goal steel storage brackets FBL-539. Goalpost safety risk assessor apparatus FBL-900.